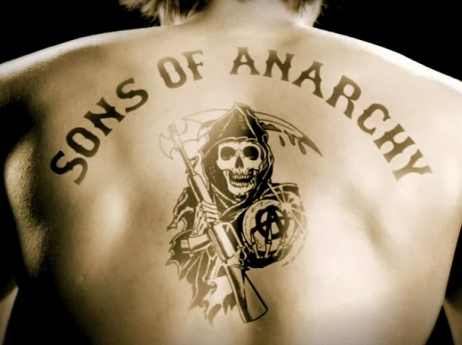 Quick Thoughts: SONS OF ANARCHY, "To Be, Part 1"
I'm pretty sure there are plenty of fans out there who were let down by the first part of the Sons of Anarchy Season 4 finale. The end of "Burnt and Purged Away" looked like it could have been a game changer, but for now things are pretty much the same in Charming. I for one have not gotten wrapped up in the idea that Clay must die for this show to be successful because that's a very narrow way to look at this narrative. Yes, most of the events that have unfolded this season have been leading towards Clay getting his comeuppance, but death is not the only logical outcome, so I wasn't upset when Opie's shots didn't fatally land. There's still more story to tell before judgment can be made. With that being said, I do think someone has to go. From the start of Season 4, my money has been on Tara, and I think "To Be" was the first step in that direction. Gemma's been plotting to have Jax kill off Clay so a Teller can reclaim the throne, but that cannot happen if Tara gets her way. In my opinion, Tara's death makes for way more compelling storytelling than Clay's. I know this may sound insane since Maggie Siff's been phenomenal this season, but Tara's always been on the outside of this show making her one of the few main characters who is expendable. While I'm not in the prediction business, I can see a scenario where Tara's killed by the Mexicans thus keeping Jax from leaving Charming, and they agree to protect Clay from the Sons. How the MC will avoid RICO is a whole other issue, but I see a showdown between Potter and Roosevelt where we learn that Potter's linked to the Cartel while Roosevelt aligns with the Sons. What it comes down to is I have no idea where the story's going at this point, but I'm genuinely excited to see how it all pans out. I agree that "Part 2" will be monumental, and it very well may be a make or break episode for me, but I don't think Sons of Anarchy's fate is linked to Clay's. I still have faith that it can all come together in the end...maybe I shouldn't though.